There are 300yd of no man’s land at the Bagratashen-Sadakhlo border crossing. A no man’s bridge spans a no man’s river and carries a trickle of fleetingly stateless trucks – no man’s transport. Two of us were on foot. An old lady dressed in black shuffled into Armenia. I was trundling my suitcase in the opposite direction, north into Georgia. Paradoxically, few places could be more distinctive than the countries we were swapping. Or different. I had been driven to the border through the bosky gorge of the River Debed, whose steep sides were deep enough to be in shadow in the middle of the day. The river teased the road, appearing first on one side and then the other. But the road itself was so badly potholed that drivers wove between craters. Then suddenly we were confronted by an abandoned factory. In such a sylvan scene it came as a shock. I had come to expect dilapidation in Armenia’s towns, whose edges were frayed in dereliction. Once-vigorous state-owned factories now looked like scrapyards. Clapped-out vehicles were littered around buildings of blackened concrete. Yerevan, the capital, was the same. It’s a grey, utilitarian city, except for Republic Square, formerly Lenin Square. More oval than square, it’s ringed by ceremonious neoclassical buildings faced in tufa stone, pink and mottled like mortadella sausage. Among them is the History Museum of Armenia. According to my guides, the triumphs in Armenia’s history owed as much to low cunning as to high command. In 1918 they duped the Turks about the size of their army, and in the Seventies they conned the Soviet leader Leonid Brezhnev into sanctioning the Yerevan metro. Under Moscow’s diktat, cities had to have a population of a million to qualify for an underground. Yerevan was half that size, but the Armenians contrived a big traffic jam to persuade the old goat otherwise. In the History Museum another guide launched into what was to become a familiar chorus. Standing beside a map of “historical Armenia”, she pointed to the lands the nation had lost, first to the Ottomans and Persians and then to Russia. “This country is one tenth the size it used to be,” she said resignedly, before moving to a Bronze Age leather shoe, the world’s oldest. More significant was a fifth-century Bible, whose illuminated pages shone as fresh as wet paint. Armenia was the first country to adopt Christianity as its official religion. That was in 301, almost within touching distance of the crucifixion. To this day the true glories of Armenia are spiritual. I visited 10 monasteries and churches in three days, the earliest dating from the fourth century. The newest was the least typical, not least because it had seats. In the Orthodox Church worshippers normally stand. Yerevan’s cathedral of St Gregory the Illuminator also has more windows than older churches. Consecrated in 2001 to celebrate 1,700 years of Christianity, it feels more auditorium than cathedral. Relics of St Gregory, who converted the country, are kept beneath an imported Baroque panoply. We drove south from Yerevan through a valley of scruffy agriculture; a shepherd chivvied his sheep down the road; watchtowers staked out the frontier with Turkey. At the monastery of Khor Virap there should have been a view of Mount Ararat across the border, but it was cloaked in cloud. The site’s attraction now is the rock pit, down a 27-step ladder, where St Gregory was imprisoned for 13 years in 288. Outside, boys were taking money to release doves, aka homing pigeons. Another Armenian ruse. West of the capital, at Echmiadzin, Mass was being sung in the cathedral. Nine priests, two in black hoods, glided before the high altar to a mystical choreography. Their gutsy plainsong swirled around the domes. A woman approached me and spoke in Armenian. Apparently I was being ticked off for crossing my hands behind my back. Echmiadzin has been at the heart of Armenia’s religion since the fourth century. In elaborate silver-gilt cases in the cathedral museum, there are claimed to be not only splinters from Noah’s Ark and the True Cross but the heavy iron head of the spear that stabbed Christ at Calvary. The thrill of Armenia’s churches comes not so much from their ancient masonry or antiquities but from their energy as fervent power plants, steeped in the certainties and rituals of the faith they have kept for more than 1,000 years. At Geghard monastery, a Unesco World Heritage site, two churches have been cut into rock. A monk billowed in, enveloped in a cloud of incense and irritation. He swung his rattling censer with the urgency of one fumigating the place against a dangerous outbreak of doubt. Back at the border, those 300yd between Armenia and Georgia converted into more like 50 years in time. Unlike the functional sheds in Armenia, the Georgian frontier post had the sheen of a motorway service area. Georgia is as glossy as Armenia is matt. A road of baize-smooth asphalt sped past trim fields to the capital, Tbilisi, a city in the throes of recovering its style. Soviet drabness is being sloughed off while fine old 19th-century merchants’ houses are restored. Aggressive new architecture is being flung up along the banks of the River Mtkvari, which bisects the city. Georgia is on a roll, luxuriating, in Tbilisi at any rate, in the bounties of aid and investment. And where the good life exists it’s expressed in food and drink. There’s a bronze statue in the city of a tamada, or toast master, a witty little fellow clasping a drinking horn, who symbolises the country’s dedication to feasting. That is one emblem of Georgia; its churches – stocky stone buildings hunched around pepper-pot towers – are another. For more than 1,000 years they have stood for the one constant in life, whatever its vicissitudes – and vicissitudes don’t come more threatening or violent than in this part of the world. During its millennium of existence, Alaverdi Cathedral, famous for its frescoes, has been damaged by the Mongols, Persians, earthquakes and Soviets. Tbilisi’s Holy Trinity Cathedral was completed in 2004 to commemorate 1,500 years of Christianity in Georgia. Its gilded tower, fluted like a lemon squeezer, dominates the city. Sunday Mass was a strange mix of solemnity and socialising. With no pews, the congregation wandered about as if at a reception, combining their devotions with catching up with friends; one girl was on her mobile. In Tbilisi I joined a tour led by Rev Dr William Taylor, a London parish priest and authority on the Orthodox Church. We drove south to the Azerbaijan border through the semi-arid highlands of Kakheti. The road was narrow and pitted. William, who had just talked of asceticism introduced from Syria, said it reminded him of Central Asia. The similarity must have struck the Russians too. They used the area as an artillery range during their war in Afghanistan. The rough track ends at the David Gareja monastery, where a great tilted slab of sandstone is riddled with monks’ cells hewn into the rock. It’s one of Christianity’s earliest outposts. Part of the complex is in Azerbaijan, a situation disputed by Georgia, although there was no obvious frontier. The monastery was founded in the sixth century by St David, one of the missionary Syrian Fathers, who is buried here. For pilgrims, three visits to David Gareja counted as one to Jerusalem. Above the troglodyte monks is another monastery in a terrace of natural caves, some richly decorated with medieval frescoes. 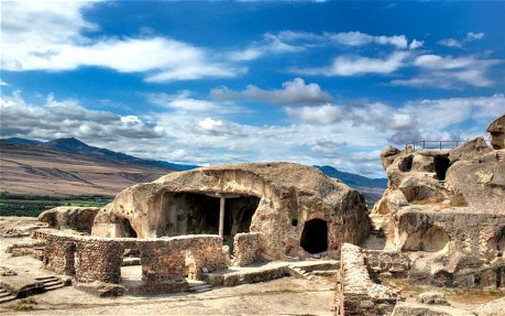 Uplistsikhe, 40 miles west of Tbilisi, is a cave city dating from the 10th century BC. Erosion and earthquakes have damaged much of it. But of the 700 caves that perforate the hillside, 150 are open to visitors. All the accoutrements of ancient urban living were cut from sandstone – prison pits, wine presses, stores, drains, grain silos, basins for animal sacrifice, market stalls, theatre, apothecary and church. It’s an extraordinary settlement, and once sustained 2,000 people. Six miles up the road is a museum commemorating Stalin, a local boy made bad. He was born in Gori, not a bad name for a town associated with one of the most murderous dictators in history. His mother wanted him to go into the church; there’s a photo of him as a chorister. Track the parabola of his life from the shack in which he was born to his armoured railway carriage and Death Mask No 6. Among the 15 religious sites we visited were two on Unesco’s World Heritage list. Bagrati Cathedral and Gelati Monastery, both near Kutaisi, date from the 11th and 12th centuries, Georgia’s “Golden Age”. In the monastery an early 12th-century mosaic of the Virgin and Child, made of more than 1.5 million tesserae, is one of the marvels of medieval art. Jvari church, north of Tblisi, is even older. It was here, in the sixth century, that St Nino raised a cross in triumph over paganism. It has been described as the most sacred place in the country. In Georgia that’s saying something.